Everyone that visits Broome heads for Cable Beach at some stage of their visit. Many people choose to stay at a hotel within walking distance and enjoy the sun setting into the sea each evening. Camel rides are a popular sunset activity for those who want a slow walk! The most common bird along the stretch of beach that the camels walk is the Silver Gull and easily observed and ignored by the majority! However, there are other birds to be seen by the observant. 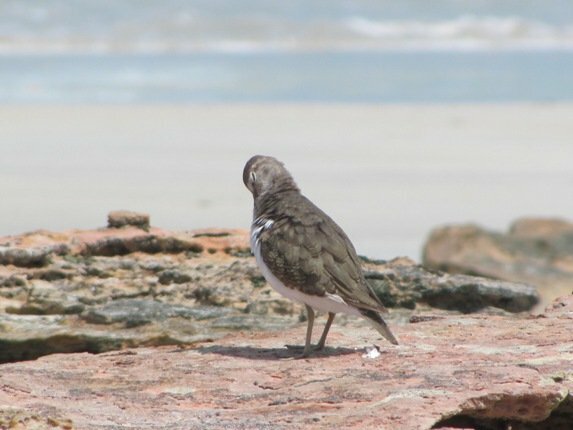 There are very few shorebirds on Cable Beach during June, July and August apart from our resident Red-capped Plovers and Pied Oystercatchers. 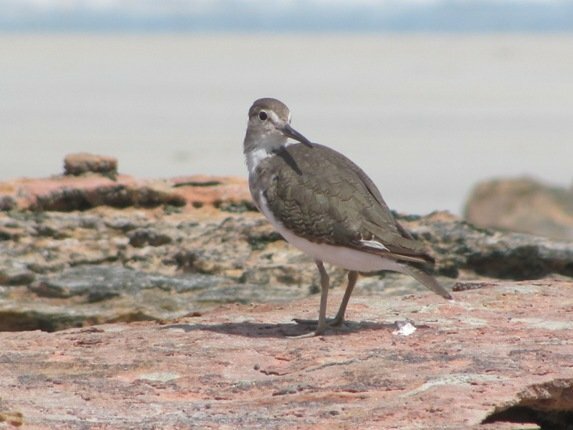 In September we keep an eye out for our returning shorebirds from their migration and they soon arrive to run frantically feeding along the shoreline. On occasion there have been flocks of juvenile Great Knot that seem oblivious to the people as they feed. They have arrived from the north and have probably not yet encountered people. 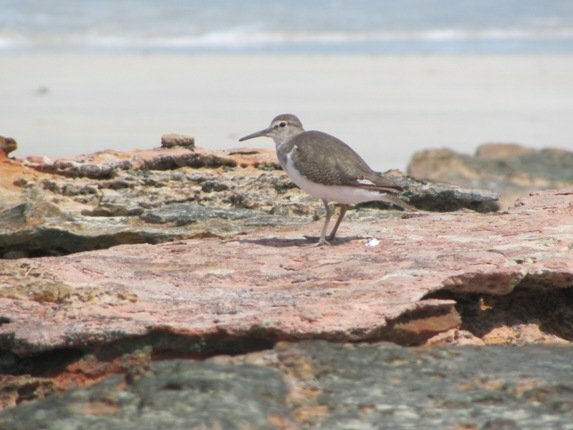 In amongst the small patch of rocks on Cable Beach you may be lucky enough to see a small shorebird that has just returned. 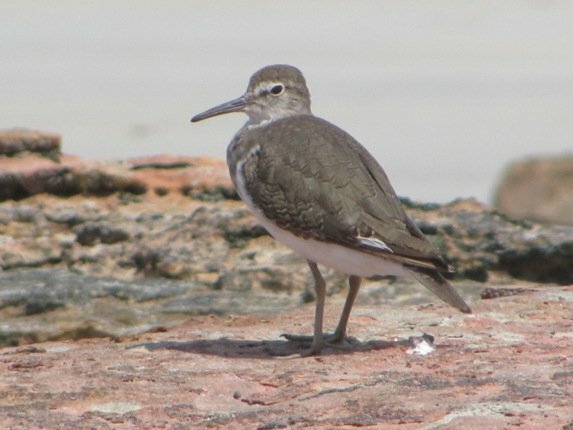 This Common Sandpiper appears in late September or early October each year and seems to favour this patch of rocks. 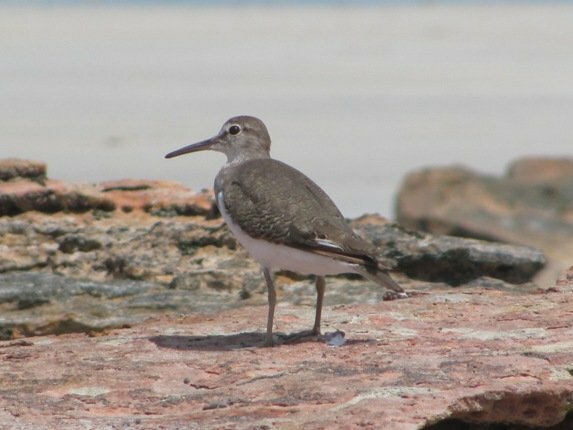 Common Sandpipers are not as common as other shorebird species in Broome, as there are only approximately 3000 in the whole of Australia. They run in between the rocks and their flight is quite distinctive with rapid wing beats followed by short glides and a shrill call. When they stop you will observe a distinct behaviour where they wag the rear end of their body and tail almost continuously and this is known as “teetering”. On a very high tide you may find several birds together, but generally they are alone. 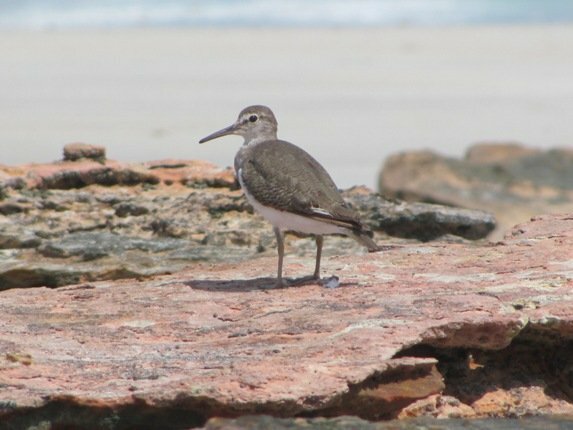 Here are some photographs of our recently returned Common Sandpiper at the rocks at Cable Beach….if you visit you should keep an eye out! Incidentally, if you were wondering why the beach is called Cable Beach it is because there used to be a cable that linked Broome with Java. From Broome the communication was transferred to telegraph lines as far as Perth. The cable was abandoned in 1914. This post has been submitted to Bird Photography Weekly #163. Go check it out!